Descent to Revolution is an exhibition featuring five international artist collectives and collaboratives that respond to the social and economic frameworks of a city. This blog documents their activities and productions during residency in Columbus, Ohio. Visit Bureau for Open Culture to learn about the exhibition and the artists. 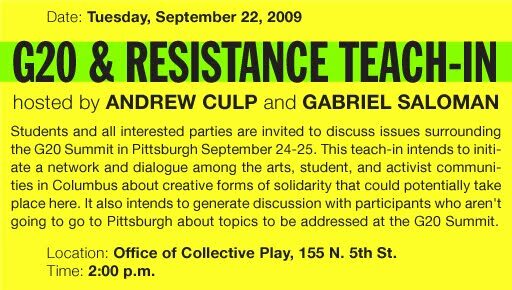 Office of Collective Play is the headquarters and programming for Descent to Revolution. It is located downtown at 155 N. 5th St. at E. Spring St.
Descent to Revolution is curated by James Voorhies and organized by Diana Matuszak of Bureau for Open Culture at Columbus College of Art & Design. Cassandra Troyan is bureau correspondent. All events are always free and always open to the public. The exhibition is supported by the Greater Columbus Arts Council, étant donnés: The French-American Fund for Contemporary Art, The Danish Arts Council’s Committee for Visual Arts, Ohio Arts Council, and the Puffin Foundation. Media support provided by CD101.